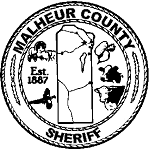 The purpose of the Malheur County Sheriff’s Office is to provide community service. This includes crime prevention, deterrence, apprehension and detention of offenders, recovery and return of property, the safe movement of traffic and public service. Peace, in a free society, depends on voluntary compliance with the law. Malheur County is one of the largest counties in Oregon. We are experiencing a growth in our population that only adds to the animated diversity that makes it such an appealing place to live and raise a family. As Malheur County continues to grow, the enduring partnership of citizens and law enforcement becomes of greater importance.